Over the weekend, we had a charming couple, Gloria and Geoffrey Thomas, move into their new home in our beautiful location of Gattington Park in Lincolnshire. Geoffrey is originally from London and Gloria is from Cornwall. Their son was a police officer with the MET, London and he moved to join the Calgary Police Service in Alberta, Canada a few years back. Gloria and Geoffrey have spent the last few years with their kids and grand-kids but an issue with their permanent residency documents has led them to move back to the UK. They started the process of thinking about a good place to move back into, around the early part of 2018. They googled various options and when they checked out the Wyldecrest park’s website, they felt they had found their new home. One of the main considerations for them in choosing a park home was the ease and the trouble-free retirement life it offers. They were also conscious of the cost and wanted to get the most for their money’s worth. They initially looked for residential parks in Cornwall and Devon area but they found they were not able to find something they really liked and which was within their budget. They visited Gattington residential park and met our Manager, Ms Claire Blount who showed them around. Gloria and Geoffrey were delighted with the fact that it was a small, close-knit, clean and affordable community park. Gattington Park has 36 homes and the park community is very friendly and has a great sense of belonging. They felt the positive vibes as soon as they stepped into the park and it made them make up their minds pretty quickly. Leaving kids and grandkids behind to move into a new home can be a very painful experience but having friendly and supportive neighbours really made a difference for them and helped them through that difficult transition. They also liked the fact that it was quiet and very well maintained and they decided on a brand new beautiful Omar regency unit. It has 2 bedrooms, a spacious lounge and kitchen area and also showers in the bathroom which was very important for them. Also, the location of Gattington Park and its promise of a country lifestyle along with the peace of mind of living in a secure, well-maintained community helped them make this move with confidence. Once they visited the park and decided they wanted to move in, they flew back to Canada and everything was done over emails and phone calls. They literally flew into the UK and checked into their new home right away as it had all been planned and arranged in a way to minimise inconvenience to them. 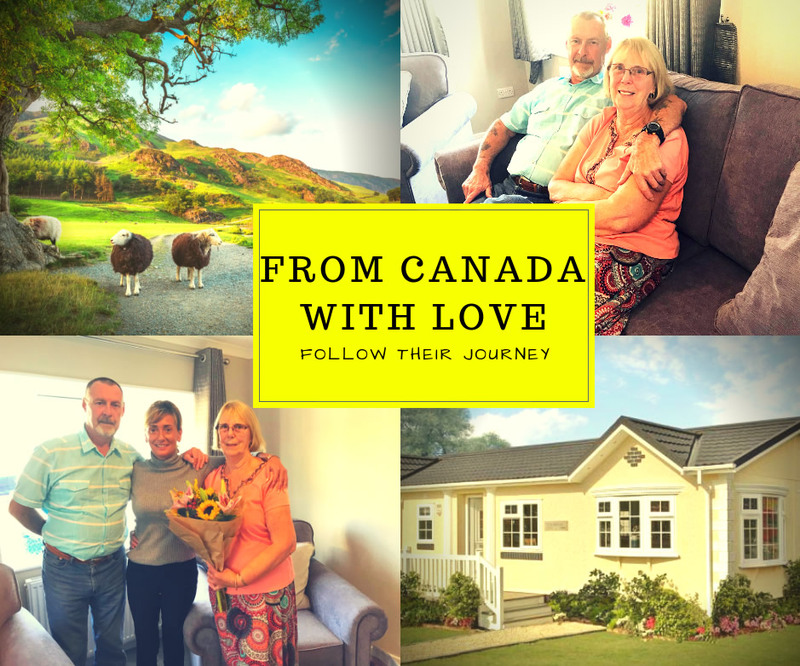 Well, we hope you enjoyed being part of their journey of finding a retirement park home. We at Wyldecrest are lucky to meet and be able to help all the beautiful people who are setting out on their new adventure in life and who are seeking to find their own slice of heaven on earth! Why not see for yourself, please get in touch with us and book a visit to Gattington Park today? If you are considering the move to a park home or you’re interested in buying a park home, sms HOME to 82228 or call us on 0330 1337300.